Hires collected on a Friday are to be returned on the following Monday. If you require a different system from the examples listed below you can either e-mail us ( sales@swlighting.co.uk ) giving us as much detail as possible, or telephone (01626 890806) and speak to one of our experienced team. Pictures are examples of the kit we have, but may not be the actual kit provided, if not equivalent specification equipment will be supplied. We do not charge for Sunday. 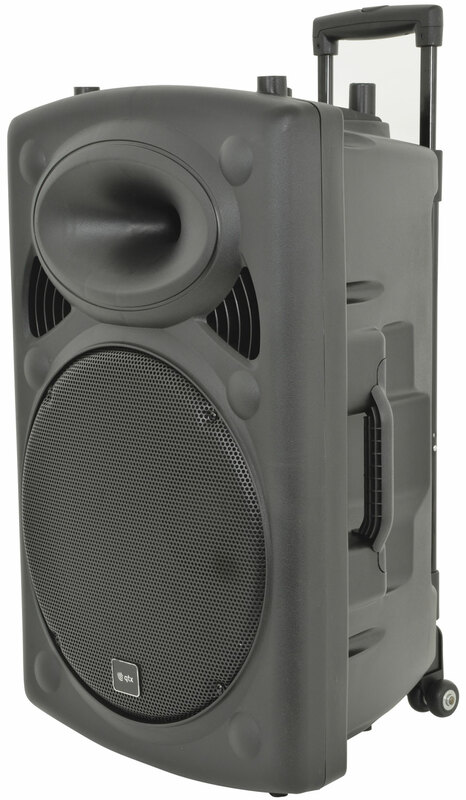 Portable battery or mains powered PA system with radio microphone and MP3/usb player. Suitable for small outdoor presentations, announcements, back ground music etc, where mains power is not available. Upto 8 hours battery life (just mic), 5 hours with music played. Easily wheeled into position. A similar unit to the one above except its larger with a 15" main driver and has more power. Ideal for busking, anouncements, outside background music/acoustic sets, party indoors/outdoors.